Better Photography (published by Infomedia in Mumbai) ran a black & white special in its July 2008 issue. They wrote to me in May to ask for a picture to use the “in my best shot” segment. I decided to submit my image “Kalakad tree.” It compliments the interview and portfolio in the July 2006 issue very nicely. The recent issue of Better Photography includes a variety of practical articles on making pin hole cameras (more on this later), using Adobe Photoshop to create digital B&W, to the zone system and more. 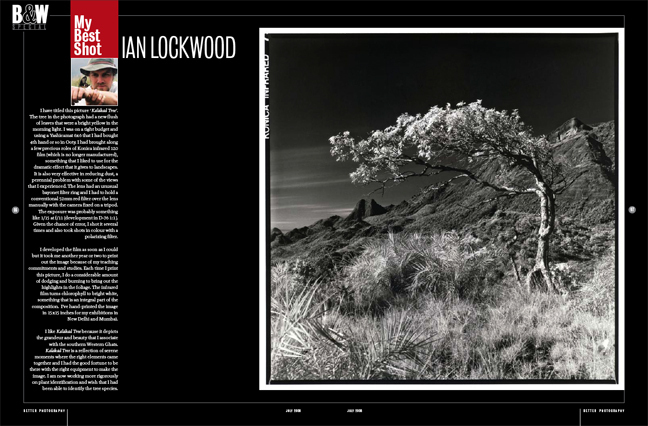 The “showcase” section features an interview with Jeff Zaruba, a review of Ansel Adams’ seminal work, a portfolio by Varun Maira and then my “Kalakad Tree” write up (see link for a PDF version). Unfortunately the magazine was not able to print the full description that I wrote and I’ll include it here for interest. Despite our best efforts landscape photography is rarely a purposeful endeavor and is more likely the result of old fashioned serendipity. I’ve spent a good deal of time trying to understand weather patterns, seasonal changes, how films work in different light situations, the mechanics of various cameras etc. However, in the end the pictures that I respond to most transcend technical jargon and are more a reflection of a moment where all the right elements serendipitously came together. 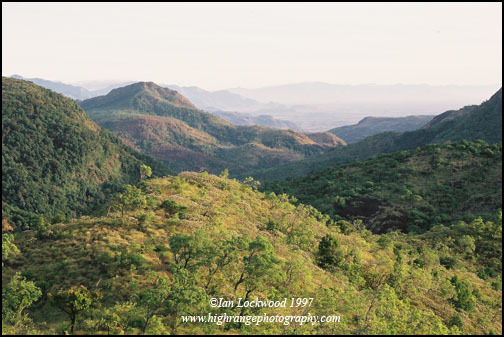 Many of my efforts in the last 16 years have been focused on documenting the Western Ghats landscape with a goal of raising awareness about the need to protect the area from various types of threats. As a child and young adult growing up in India I was struck by the dearth of images that did justice to the land that I experienced. My photography and love affair with the Western Ghats was a response to this. The fact that land-use changes were dramatically altering what I had once taken for granted gave the work a sense of urgency. 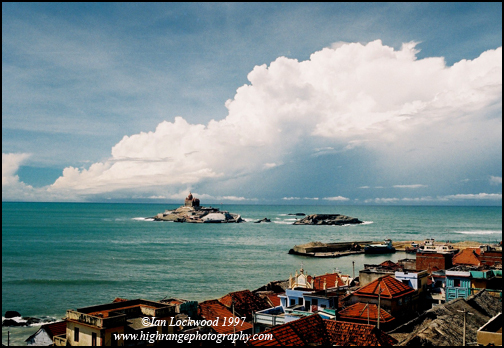 In the summer of 1997, shortly after meteorologists in Trivandrum had announced the arrival of the South West Monsoon, I journey down to Kanyakumari and Kalakad Mundanthurai Tiger Reserve. I only had five days for this visit and soon had to be in Cyprus to pursue graduate courses in education. I was recovering from a nasty bout of cerebral malaria that I caught looking for rare birds and plants in the Garo Hills that spring. Now I was eager to get back into the field and continue my ongoing exploration of landscape, ecology and culture in the Western Ghats. Several of my friends who work as wildlife researchers in the early 1990s had told me about the forests of Kalakad and it was my goal to visit a remote bungalow that overlooked the eastern slopes of the hills in the southern most Western Ghats. After spending the night in a spartan dormitory at the foot of the hills I caught a lift up the dilapidated ghat road in a department truck. It was mango season and my only meal had been an assortment of delectable neelam and thothapuris. The day was spectacularly clear with a deep blue sky and beginning-of-time freshness in the air. On the way up we stopped several times to observe troops of Nilgiri Langurs (Semnopithecus johnii), a flight of four Great Pied Hornbills (Buceros bicornis) and the unfolding views. To the south and east the blue horizon of the Gulf of Mannar was visible (I would see Tuticorin’s lighthouse that night). Several prominent granite faces protrude from the dry scrub forest that lies in the rain shadow of the hills. Undisturbed evergreen vegetation spilled over the ridges on their higher slopes. This unique transition of vegetation in such a short distance is what makes the area amongst the most biologically rich areas in all of India. The tree in the photograph had a new flush of leaves that were a bright yellow in the morning light. I was on a tight budget and using a Yashicamat 6×6 that I had bought 4th hand or so in Ooty. I had brought along a few precious roles of Konica infrared 120 film, something that I liked to use for the dramatic effect that it give to landscapes (the film is no longer manufactured). It is also very effective in reducing dust, a perennial problem with some of the views that I experienced. The lens had an unusual bayonet filter ring and I had to hold conventional 52mm red filter over the lens manually with the camera fixed on a tripod. The exposure was probably something like 1/15 at f/11 (development in D-76 1:1). Given the chance of error I shot it several times and also took shots in color with a polarizing filter. I developed the film as soon as I could but it took me another year or two to print out the image because of my teaching commitments and studies. When I print this picture I do a considerable amount of dodging and burning to bring out the highlights in the foliage. The infrared film turns chlorophyll to bright white, something that is an integral part of the composition. I’ve hand printed the image in 15’x15” for my exhibitions in New Delhi and Mumbai. 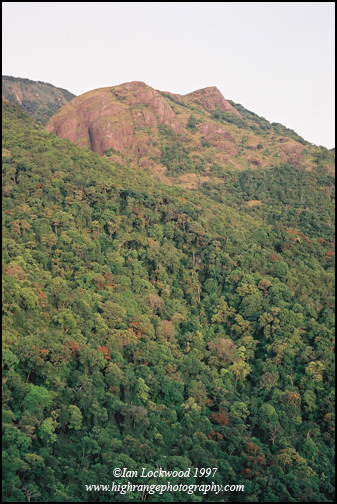 I like Kalakad tree because it depicts the grandeur and beauty that I associate with the southern Western Ghats. Kalakad tree is a reflection of a serene moment where the right elements came together and I had the good fortune to be there with the right equipment to make the image. I am now working more rigorously on plant identification and wish that I had been able to identify the tree species.